"Guruji" to his older students and Bala to his friends and audiences . Born in Madras to a Telegu family, he was destined to play the mridangam. His late father, Sri K Mutukrishnan, was a renowned mridangist, especially in the field of Bharatanatyam. Bala-ji was trained by his gurus Sri Coimbattur Ramaswamy Pillai and Sri Ramanathapuram M N Kandaswami Pillai. They, in their turn, learnt from the great Palani Subramaniam Pillai. More recently he has studied advanced Kanjira and calculation with Mayavaram G. Somasundaram. He combines a great adherance to the techniques of his gurus with his own innovative style of playing and teaching. He is one of only a handful of mridangists to exclusively use the technique, devised by PSP, of using the second finger instead of the third of the right hand to stop head when playing Nam and Dhin. This technique is much harder to learn, but gives better sound and greater flexibility. A professional mridangist from the age of 15, he followed in his father's footsteps, becoming a favoured accompaniest of dancers such as Dr Padma Subramaniam and Alamel Vali as well as working with N V Narasimhachari. On the concert platform he accompanied T V Gopalakrishnan, M S Gopalakrishnan, T N Krishnan, Dr M Balamuralikrishna and other great artists. As well as accompanying these artists at home and abroad (he has played in 26 countries) he trained students in India to proffessional level. He plays also with Hindustani musicians (notably Ravi Shankar), Kathak dancers, Jazz and Fusion groups. In 1995 he accepted the post of Resident Mridangam Teacher at the Bharatya Vidya Bhavan in London, UK. London has a large Sri Lankan community and a number of Tamil schools. The Bhavan here has a thriving Carnatic Music and Dance department with many hundreds of students. 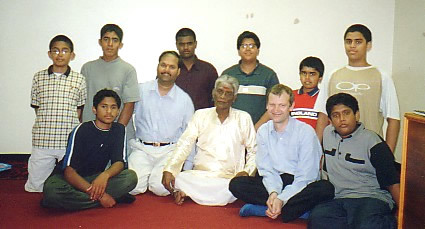 The mridangam class has at least fifty pupils and Bala-ji has presented seven mridangam arangetrams here. 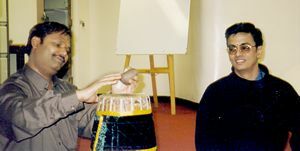 Already one of his UK students (T. Pirashanna) has acheived semi-proffessional status not only on mridangam, but also on Ghatam, Morsing and Kanjira. Still much in demand as accompaniest to visiting artists and dancers from India he is hugely popular on the arangetram stage where his humility, proffesionalism, supportive nature, attention to detail and deep knowledge of dance and music make him a welcome member of any such team. His wife, Padmashree, is also dearly loved by us all.